I had the first of my August Waterstones events yesterday, at Watford Waterstones. It was one of the quieter events I’ve done, but that’s quite nice sometimes because I get to chat more in depth with the children who come to an event. There were a few little girls who made special trips for the event, and I got to introduce Isadora to a few new children. We did colouring, and ate star-shaped biscuits kindly provided by my mum. It’s always particularly touching to meet young people who have really connected with Isadora Moon, when they make special trips to come see me. I love creating my characters and worlds just for my own enjoyment, but it’s a wonderful bonus when other people enjoy them too. Here’s a picture of me with Isabella. Her parents brought her all the way from Epsom to my Watford Waterstones event. This girl, Isabella, was writing a school book review on Isadora Moon and really liked Isadora’s gothic side. 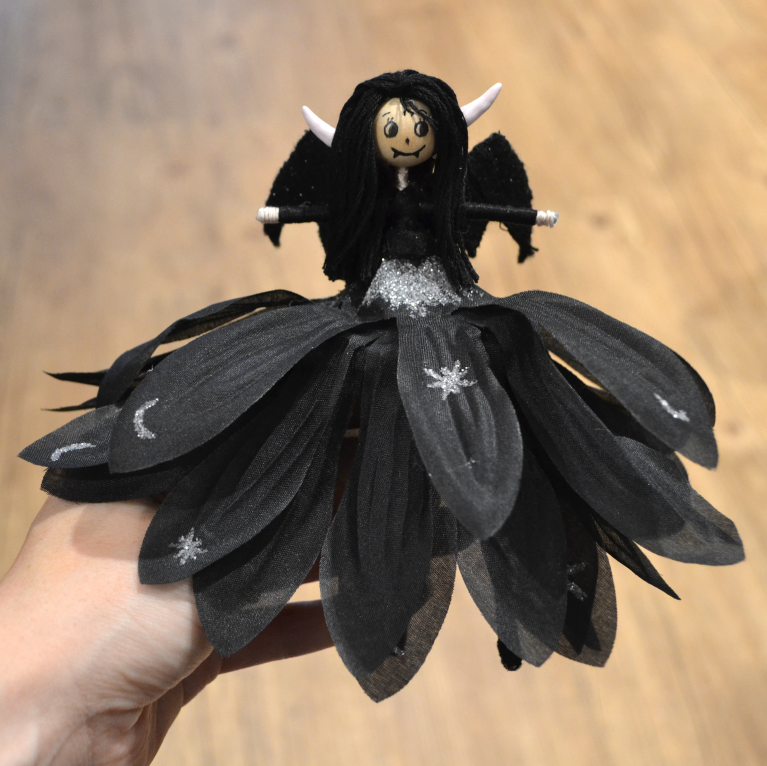 Isabella’s mum had made her this cute Isadora Moon doll, complete with pointy ears, fangs and bat wings. This doll is clearly very much inspired by Isadora’s gothic side. I was especially enchanted by this, as I love carrying around my own dolls / mascots to photograph. You can see their adventures on my instagram and my personal blog. As I was dressed up in my starry event outfit and my flower crown, I couldn’t resist getting a few snaps before the event. I love the way my dress billows out when I walk. Henry took the above photo of me swooshing it in Watford’s shopping centre. Another girl who made a special trip, was Lily. She gave me this sweet little letter. I always keep my letters from children in a special folder, and I make sure to reply to any post as soon as I can. Unfortunately, I’ve strained my wrist. I think it’s from picking up Celestine and too much shading. I don’t know whether it’s RSI, tendinitis, or carpal tunnel, but I’ve got a physiotherapy appointment tomorrow. If I’m lucky, they’ll be able to suggest something to help it get better really soon. It really is frustrating not being able to do normal things like carrying Celestine, drawing, and even opening the coffee jar. I was worried about having to sign lots of books at Watford Waterstones, especially as I usually like to add a little message and a few stars around my autograph. I came up with the idea of sticking in book plates. That way I would just have to write the person’s name and my signature. Henry made these up for me, using the chapter borders from Isadora Moon Gets in Trouble. I used these book plates to save my writing hand while my wrist is strained. If you enjoy reading Isadora Moon, or even just want to come out for a free craft activity and reading, I’d love to meet you at one of my upcoming events. You can see all my upcoming events on my events page and on my Facebook page. You might also like to sign up to my newsletter to receive Isadora Moon news and updates, craft activities, and the Isadora Moon Party Pack.